– Take out the summary section. It is a fairly dated resume convention and is unneeded. – Take out your “professional organizations” section unless you held a position. Anyone can be a member! – Your skills section lists a lot of soft skills. In general these don’t mean a whole lot on a resume. Think about ways to show you have these skills in your cover letter but take them out of your resume. I would leave the professional memberships in; it doesn’t seem like the submitter has much library experience outside of the MLIS degree. The summary paragraph at the top is superfluous. Not helpful at all to hiring committees. The Skills listed are pretty generic and also probably not helpful. It is more helpful to respond to skills asked for in an ad using the letter of application. Unless you have foreign language skills or specific software or programming skills, it’s not necessary in the resume. I do like highlighting the MLS projects. For a new librarian, we’re often looking for what the person did or gained in library school. The summary is something you should probably include in a letter of application, although I think it’s ok here. There is no library experience, so I’m assuming the study happened while this person was working in software engineering. You could extrapolate skills that could be useful in library work, I’m sure. The bullet points are useful. You mentioned that you were applying for a public librarian positions. Are you also considering systems librarian or emerging technologies positions? 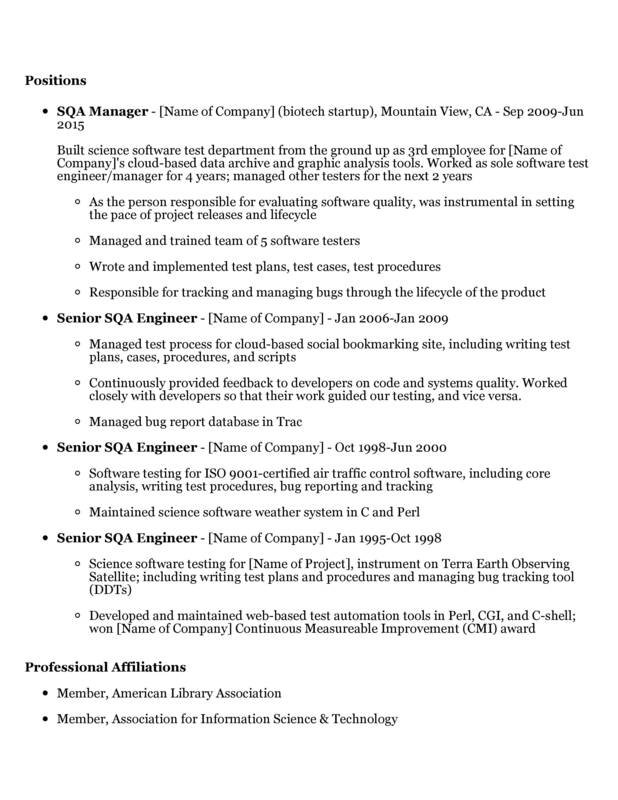 This resume screams systems librarian. The “MLIS Projects” section seems a bit out-of-place at the top of your “Experience” section, so I would move 2–3 of your favorites under your MLIS entry in “Education”. I would also do something minor to differentiate your subsection headings. For example, is “MLIS Projects” under “Experience”, or does it stand alone? I would do similarly with the contact info in your header (though you may have already done this and it just got hidden when you submitted). Similarly, I would lower the line spacing on your list sub-items, especially in your “Positions” section. At the moment, it’s a bit hard to mentally group them together under a single position heading. I’d recommend folding your “Summary” section into the summary you already have at the very top of your resume, or dropping it entirely. As it is now, it’s cluttering up your resume. I would also get rid of the bold “library and information science”; there’s plenty of stuff on your resume already about your MLIS; this bold bit is unnecessarily distracting. Finally, you may want to consider using a sans-serif font as a subconscious way to slightly boost your already prodigious tech credentials. It won’t have a major effect, but it can be a quick way to help cement yourself in the recruiter’s mind. You’ve got a solid base of computer experience here. (In fact, I’d love to hear more about your work with Terra.) You’d be a worthy contender for any number of positions, and I wish you the best of luck going forward. I agree with most everyone here. I love that you have links to your MLIS projects. I also agree that your “Skills” section is pretty generic. Since coding and such is so popular with public libraries, if you know any coding languages, I would list those. I would really highlight those areas, like I said, the Maker movement is getting to be big, and it looks like you have skills in that areas. I agree with the others and would only add, you don’t need your GPA on your resume. Also, I would leave the memberships. Good luck! Kudos to you for submitting your resume. I understand job hunting is a very frustrating process, so I hope these comments help. 1) Librarian – should be titled Summary. Some people say including a summary is necessary, some say it should be removed. It’s really up to you if you want to keep it. If you do, it needs to be more public librarian focused (ie customer service). If you feel like this information is detailed in your cover letter then remove the summary. 2) Education – remove your GPA. Only include your specialization if the job requires an expertise in digital curation or geoscience artifacts. Include graduation dates. 3) Skills – replace these with hard skills, such as any knowledge of coding, databases, programs, or certifications. Not everybody will agree that this section is necessary, but it might be good to include if you are applying for a data librarian position. 4) Experience – remove the summary under this section. Move your MLIS Projects after the Experience section. Remove the word “Positions” and start listing your previous employment. Always keep the idea of customer service, training and providing technical assistance (a biggie for you) in mind. This will help to draw parallels between your previous position and the one you aspire to. 5) Move your MLIS Projects section after Experience and before Professional Affiliations sections. I recently interviewed for a public librarian position and they asked me about my professional affiliations, so I would keep this in your resume. Other employers might not care as much. Lastly, did you do any sort of internship or volunteering relating to libraries or information centers? If so, include this in your experience section. Best of luck!